Hard to believe a week has passed since we did our part to save the arctic tundra, one load of 3-inch BBs at a time, on Feb. 2. Conservation snow goose seasons have barely started across their southern range when the Albanian Goose Mafia showed up at the door of my house in Peoria, Ill., moments after my wife's doctor had announced that A) those were indeed her early contractions, B) yes indeed she was nine months pregnant, and C) yes, she'd begun dilating. But the birth could be weeks away, the doctor also said (whew), and the Albanian Goose Mafia is not to be taken lightly. Only two of my Chicago buddies showed up, Phil and Chris, two of the loudest, most brash guys you could ever meet, ringleaders of a group of Albanian brothers and cousins I met goose hunting in Alberta, who proved to be the overbearing, sarcastic, hilarious, close-knit band of brothers I'd always wanted. They threw me in Chris Vangel's truck-mousine, a swank black new Chevy that probably cost more than my first house, along with my Beretta A400 Xtreme, a Remington Versamax and as many boxes of new Federal Snow Goose Black Cloud and Winchester Blindside BBs as I could carry. I would need them all. Nine hours of driving and five hours of sleep later, one of the easiest, best goose shoots I've been on commenced near Jonesboro, Ark. Our goose guide, Roy Rametta (618-944-1694), is as good old boy as it gets and has hunted these birds since the '80s, a pioneer in decoying the huge flocks of white geese that until then had only been shot at by ditch-divers. A south wind and sunshine, perfect conditions, he said, excited for his first big snow hunt of the year. I'd anticipated hours and hours of putting out dekes on the way down, but Rametta not only had the spread of nearly 1,500 already set, all we had to do was walk up and get in a pit that would have held six guys or more. We didn't even wake up until 5:30 a.m.! Small flocks trickled in, a dozen or so birds were dropped, and the day was already a success, when the first of a ginormous group started to work in on us. Which in turn sucked every bird for miles, as they started criss-crossing and trying to land on our heads. Chris shot some short video, but couldn't resist setting it down and shooting once the birds were within 20 yards. I can honestly say I had trouble breathing and had to force myself to take slow deep inhalations to calm myself down as the noise grew deafening. I thought they were going to blot out the sun. Rametta gets so excited he hyperventilates as well, so the two of us were a comic wreck as the geese circled on down. "Better gitcher blood goggles on, Skipper, it's about to get ugly," he'd hiss as the dropped to the spread by the dozens, telling me for the 50th time "get ready" because he was about to wet his pants. Three times we were mobbed like that, and two to four smaller flocks came in range every hour or so. We killed 68 birds, just the four of us (and Roy didn't shoot a lot) and two hunters in our group in a different blind shot three dozen more to bring the day to well over a hundred. We quit at 11 a.m., with birds still flying, and only hunted an hour in the evening before I stopped everyone for a photo shoot, during which more flocks wanted in. The birds never quit flying; I'm pretty sure we could have doubled our take if we'd hunted all day. Rametta says about every third or fourth day it gets like that. Sunshine and a south wind are key, for some reason. Most days he'll still scratch a few dozen. The next day, it poured rain and everyone had had enough by 11 a.m., not a single shot fired! What few birds flew came in low, got us excited -- and stayed 70 yards or more out. I called him the next week and he'd had two slow-ish days followed by another spectacular day of south wind, sunshine, and eagerly decoying birds. 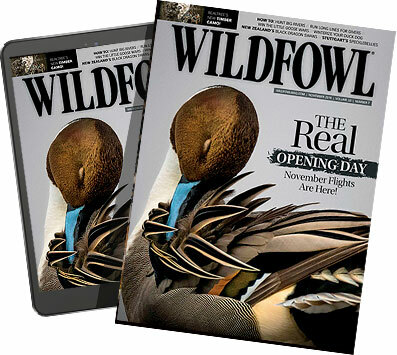 Look for a full feature on this and other snow goose hunts in Wildfowl soon. Snow populations continue to be characterized as grossly exceeding biologists' goals, severely destructive of the arctic tundra where they breed, and are generally regarded as badly underestimated even by those who count them. All I know is, we are surely blessed to live in a time of this kind of abundance, when hunters can go out and enjoy no limits shooting while still doing right by the resource. And with four veteran guys, it still took two hours to clean that many birds -- that's all the success I ever want! Rametta owns Arkansas Waterfowl Freaks, based in Johnston City, Ill.